Lien Chan’s presence at China’s military parade complicates things for Taiwan’s government. Taiwan has officially declined to participate in tomorrow’s military parade in Beijing, claiming that the Chinese Communist Party’s narrative distorts history by exaggerating its own role in the war. But that narrative is being undercut by the presence of a former high-ranking KMT (or Nationalist Party) official at the parade. 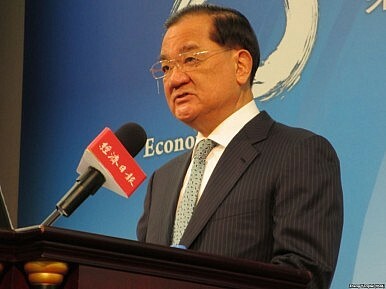 Lien Chan, a former vice president of Taiwan as well as former chairman of the KMT, is in Beijing. Not only will he attend the parade tomorrow, but he’s held a series of meetings with Chinese officials (most notably President Xi Jinping). Lien is officially going as a private citizen, but his visit provides Chinese state media with opportunities to showcase their narrative of both the war and of cross-strait relations – to the discomfort of many of Taiwan’s politicians. Ma Ying-jeou said it was “inappropriate” for Lien to attend the event. Taiwan’s Ministry of National Defense (MND) had previously urged its veterans not to join the parade, either. “Retired comrades-in-arms should steadfastly support the view of Taiwan’s government, exercise self-restraint and refrain from visiting mainland China to attend the Chinese Communist Party’s anniversary activities,” a statement from the MND said, according to Reuters. The presidential candidate for the opposition Democratic Progressive Party (DPP), Tsai Ing-wen, also voiced her concern about Lien’s participation. “As a former vice president of the nation, Mr. Lien’s decision to attend a military parade [in China] is not in accordance with the feelings of Taiwanese and could send the wrong message to the international community,” she said. Indeed, Lien’s presence in Beijing was highlighted in Chinese state media as a sign of cross-strait unity.”We hope that, through remembrance of the victory, the history and the late heroes, people from two sides of the Taiwan Strait can carry on the WWII legacy and work together for the cross-Strait peace and the revival of Chinese nation,” a spokesperson for the the State Council’s Taiwan Affairs Office said. In his meeting with Lien, Xi said KMT-CCP cooperation during the war was “a mutually supportive, coordinated effort that brought important contributions” to Japan’s eventual defeat. It’s rare for a Chinese leader to speak so openly about the KMT’s role in the war. Throughout the year Beijing has been unusually open about the Nationalist forces’ contributions. In addition to honoring both KMT and CCP war veterans for the first time, Chinese government agencies finally began recognizing KMT soldiers as veterans of the War of Resistance Against Japanese Aggression. Lien, however, went further than Xi in clarifying the respective role of the two sides. Chiang Kai-shek and the ROC forces “engaged directly with the Japanese troops in 22 major battles delivering debilitating blows to the invading Japanese army, while the CCP troops led by Mao Zedong held the enemy back behind enemy lines,” Lien said, paraphrasing the KMT”s official website. But like Xi, Lien also praised the wartime cooperation between the two sides. “We abandoned and shelved some of our different views, and we cooperated unanimously to fight against mighty powers, against humiliation and against the invasion by another race,” Lien said in a meeting with Yu Zhengsheng, the chair of National Committee of the Chinese People’s Political Consultative Conference. Taiwan’s government responded to Lien’s comments by reiterating its own stance on history. “Whether it came to engaging in combat with Japanese troops on the front lines or behind enemy lines, it was all led by the Nationalist government, which is a historical fact that cannot be denied,” Charles Chen, a spokesperson for the Presidential Office, said. He also repeated the government’s official stance that it is “inappropriate” for Lien (or any Taiwanese) to participate in tomorrow’s parade. Lien has a long history of engagement with mainland China. His meeting with President Hu Jintao mainland China in 2005 marked the first time since the Chinese Civil War that the top leaders of the KMT and the CCP had met. His outreach set the stage for Ma’s own platform in the 2008 elections, when he portrayed the KMT as the more responsible party on cross-strait relations. Ever after his retirement, Lien has remained active in cross-strait relations. However, Lien’s repeated trips to the mainland and remarks with Chinese leaders (this week marked his third meeting with Xi Jinping) can cause headaches for the Ma government. Taiwan’s current administration often has to scramble to clarify its own positions in response to media coverage of Lien’s remarks. Plus, a bullish view on China's economy and Taiwan snubbing China's military parade. Friday China links.